My baby had his second birthday today. He is so much a little boy now... gone are his baby days. Nicholas was totally spoilt and received some great gifts from his family. He has been grinning all day (except when Mia & Chris kept taking his new toys off him). 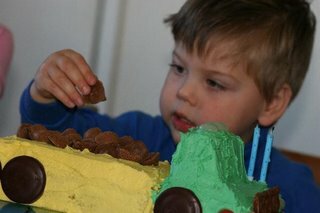 I made him a truck cake (designed from my head, as I did it - very dodgy, but he loved it). Unlike Christopher, Nicholas LOVED all the attention. It wasn't until after all the photos were taken that I realised I still had him dressed in his daggy skivvy! Oh, well. He's cute enough anyway. I went to a crop last night at Scrapbook City and had a ball. I missed Jill, who didn't make it in the end, but had fun with Ang, Sara N, Tammy, Amanda & the Irish Dancing Queen (ROFL!). Kerri was great fun running the night - she is so lovely. I also bought some of the new SEI papers - YUMMY! Very kiddy-cute. I started four layouts and didn't finish any. I hope to get them done tonight. We also had a funny phone call to a little-bit-tiddly Zane celebrating her 30th birthday. ...how cute is that? He barely roused when I popped him back in bed. I'd better dash to grab some scrap gear and watch the rugby. Go the Waballies!! 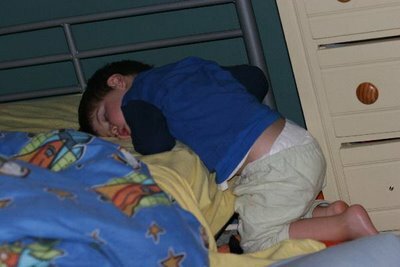 awwww....my jakey (who is now a strapping lad of 15) used to sleep like this WITHOUT falling out of bed. just toooo cute. i hope your little boy had a great birthday. he looks like he loved his cake. 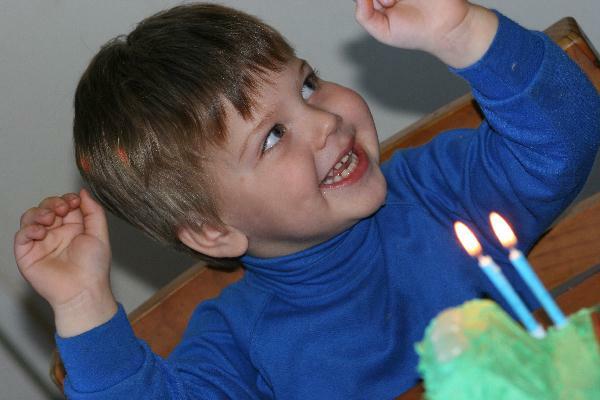 Happy Birthday Nicholas! Looks like he had a good time. That cake looks yummy! Happy Birthday Nicholas. Hope you got lots of pressies! Great cake Sara. Now go and back up those photos NOW!!!!! That sleepy pic is almost identical to Kyan's. PS a very belated happy birthday to Nic too! A big hug from Zane. 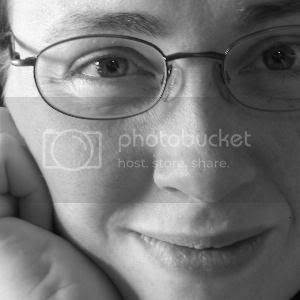 I'm a photographer with a fantastic husband and four gorgeous children. Thanks for visiting. Copyright 2008 Sara M Pearcy. All rights reserved.